Boxing is one of the greatest sports in history. From inception, the sport has been one of our favorite pastimes, as watching disputes and grudges settled inside the ring never gets old. In the long history of boxing, there have been MANY classic bouts and fights. Whether the big ticket or just an all around great fight from start to finish, there have been some amazing boxing matches that we have been blessed to see. Today, we wanted to narrow it to down to 7 of the best of the best. With that being said, let's get into a look at the 7 greatest boxing matches (Hint: there are no Mike Tysons fights because.... yeah). 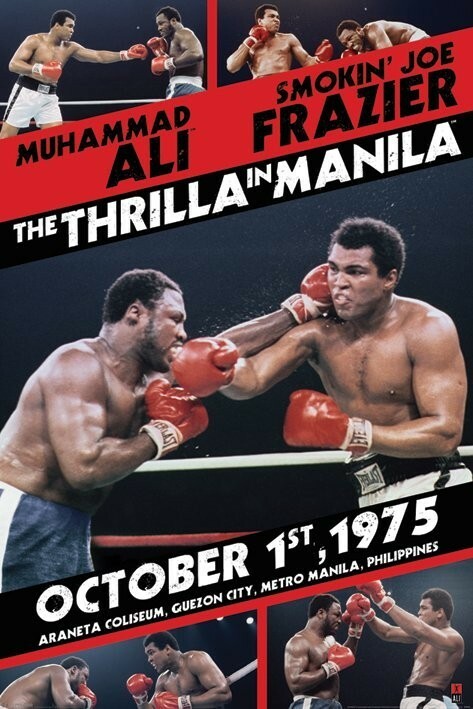 -The Thrilla In Manilla. The greatest fight in the history of boxing if you ask me. 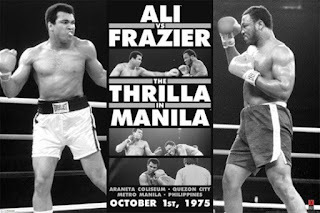 The trilogy between Frazier and Ali is the greatest trilogy in boxing and I absolutely loved every second of this feud between two of the greatest legends to lace up their gloves. This one was the final bout. The last match between the two heated rivals came in the Philippines and would decide who the true winner of their feud would be. 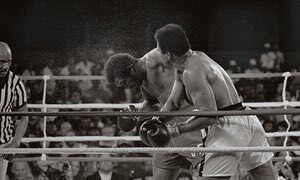 After Frazier shocked the world by winning their first bout, Ali came back and won a controversial second fight leading us to the rubber match. The final confrontation. 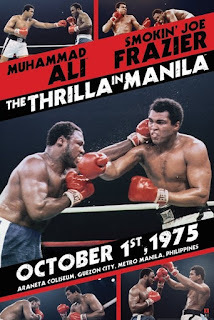 Through the fight, it looked like both men were willing to give it everything they had, with Ali comfortably handling the first few rounds before Frazier managed to gain his footing and start to fight back harder. By the 6th round, Frazier had taken control of the fight and he would stagger Ali with a set of blows, but Ali would refuse to fall. 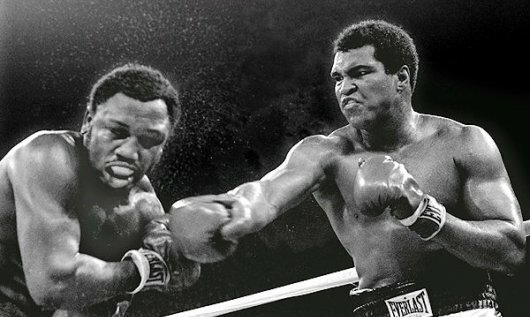 Ali would soon prey upon Frazier's weakness: his sight. Aiming for the head constantly, Ali would stagger Frazier enough to bother his already bad vision and from there, it was all she wrote. Frazier took blow after blow and after round 14, the fight was stopped. 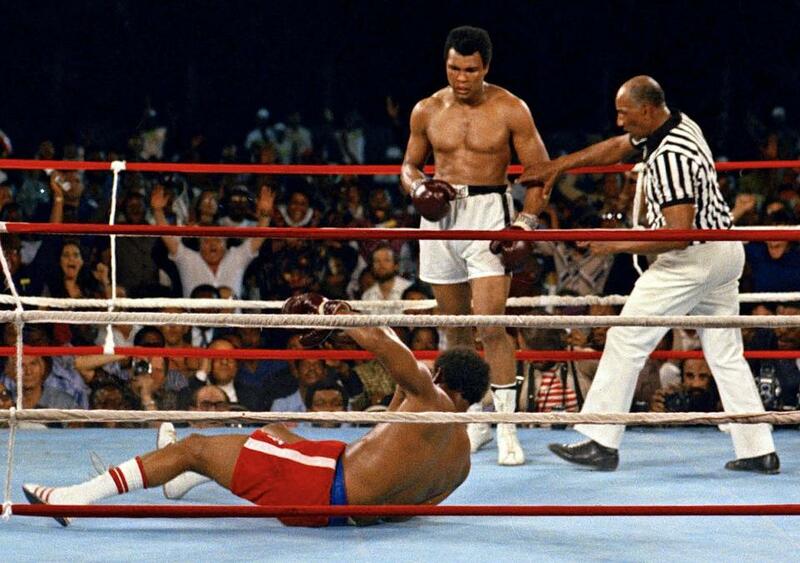 Ali won the bout and the series 2-1, but both men would never be the same again after the fight. The greatest trilogy in boxing history is honestly the most brutal I've ever witnessed. 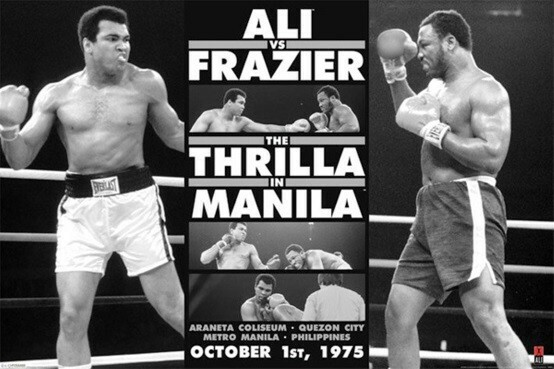 It showcased that both Ali and Frazier were the two of the absolute best, if not the two best. -The year was 1981. Tommy Hearns was the Hitman. His style was seen as too much for any fighter to overcome and he walked into the fight undefeated. 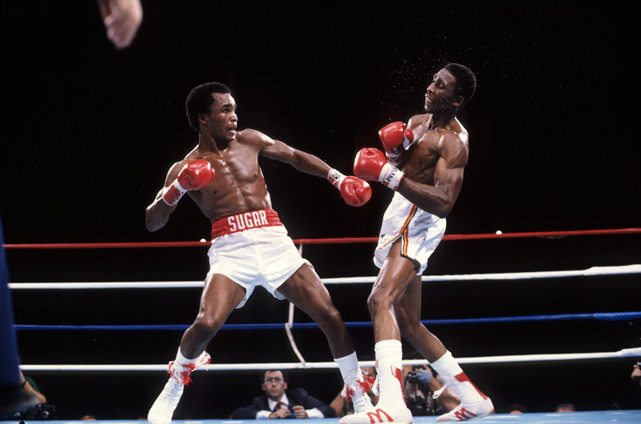 Sugar Ray Leonard only had one loss to his name and was seen as one of the best. Both men were champions on a collision course and in Caesars Palace, these two men would meet to unify the World Welterweight Championship in a match that was simply dubbed "The Showdown". 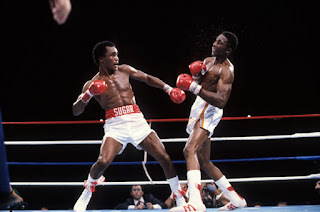 In front of 23,000 people, Hearns and Leonard took it to each other, as both men took turns having control of the fight. 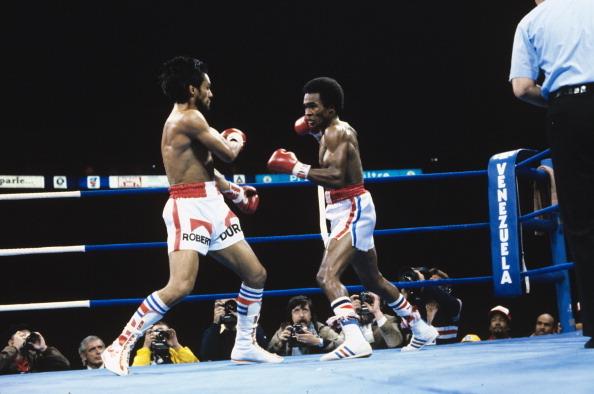 After round 12, it seemed as if Hearns had taken control of the fight and Leonard seemed poised to fall to Hearns. 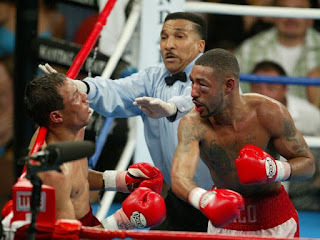 After round 13, Leonard reached down and found a second wind and hit Hearns with a barrage of punches that slowed him. 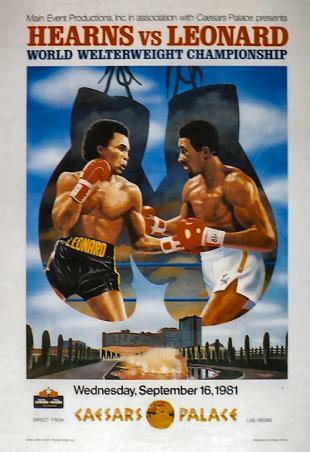 According to the scorecards so far, Hearns was winning the fight and on his way to victory, but Leonard would NOT be defeated. 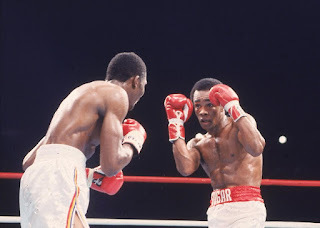 He ended up pinning Hearns against the ropes in round 14, swinging with a ferocious aggression that would cause the referee to stop the fight and award it to Leonard. Hearns and Leonard would do battle 8 years later in another big time fight, but it didn't have the feel of this one. Both men were in their primes and seemingly unstoppable and this was a fight that will always be remembered. 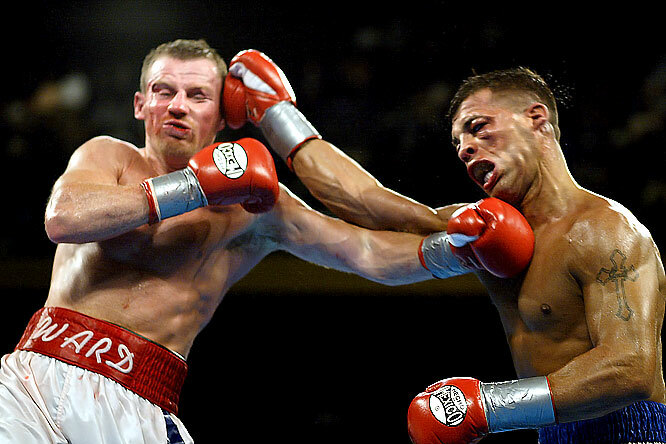 -An underrated fight when considering the boxers involved, this is one of the most physical contests I've ever watched in boxing history. The first of their two fights was a classic, with both fighters giving it everything they had. For the first 9 rounds, both men would go at each other with everything they had, as the aggressive punches just kept landing and landing. Eventually, something had to give. 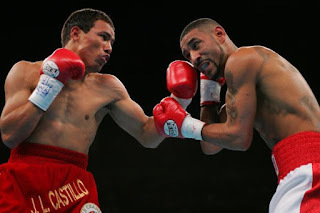 In round 10, Castillo finally had a breakthrough when he knocked Corrales down, then he would repeat the feat, which seemingly changed the course of the entire fight. It seemed as if Corrales was down for the count, but miraculously after getting knocked down for the second time, he reawakened. Corrales fought back before the round ended and caught Castillo with an amazing right hand that staggered the once dominant fighter and Corrales sensed his weakness. Corrales would come back with fists of fury, punching Castillo's lights out and forcing the referee to stop the fight, resulting in a huge TKO victory for Corrales. After being knocked down and seen as all but done for, Corrales fought back and won it. For that, and that classic final round, this fight is one of my all time favorites, which is why it makes the list. 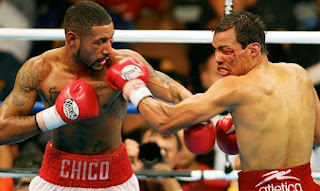 -For fans of boxing, this bout (their first of three) is one of the most hard hitting contests ever. The other two of their trilogy would be great, but I'm forever partial to their first encounter. Make no mistake about it, these two gave it everything they had in the ring. In what has to be the most brutal trilogy in boxing history (but not the best), these two fighters went at it in 2002. With every round, the fighters became more aggressive and more ferocious, and as the fight continued on, we knew we might be witnessing the next great boxing rivalry. 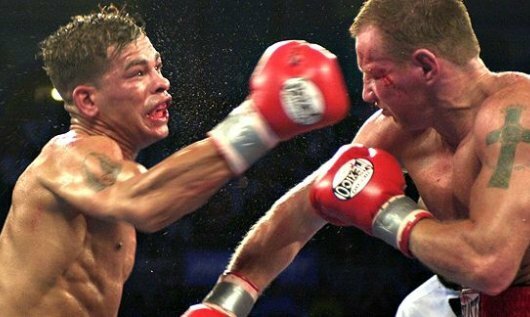 The fight was about as even as you can call it, but the 9th round knockdown of Gatti proved to be the decision maker, as he walked away with a majority decision win. However, when the fight was over, both men needed to be treated at the trauma center, so while Ward took home the victory, it's hard to say that any man actually won. This is one of those matches that you have to see to believe. -There was a movie made about these two fighters recently, and it's no surprise that this bout makes the list. Their fight is the stuff legends are made of, and while many people don't speak of their first battle, it is their best and one of my all time favorites. The "No Mas" fight is their most infamous, but their first fight is their greatest work. After Duran had hurled off numerous insults to Leonard, Leonard let the fighter take him off his game and tried to beat him at his own game. 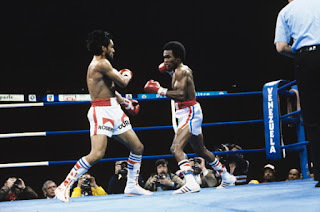 Leonard was lightening quick, but he abandoned that for a style more similar to Duran, a mistake that essentially made the fight more even. I've always believed that Sugar Ray would have won easily if he hadn't taken things so personally, but this was about as evenly matched as a fight could be. In the end, Duran would walk away with the decision, barely edging out the score with the judges. 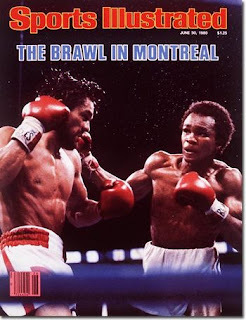 The Brawl In Montreal is still one of the greatest fights and it's a bit sad that it's not remembered as much as the lesser, much weaker rematch that Duran quit on. -There was no doubt that you'd see two Ali fights on this list, both of which are the most iconic in stature towards his legacy and the boxing world. I chose this one because it was one of those rare times that Ali was the perennial underdog. Dubbed "The Rumble In The Jungle", this fight is one of those rare fights that lived up to the hype and then some. With 60,000 in attendance, the heavy handed and undefeated Foreman walked in against Ali, who seemingly had nothing to lose at this point. Ali was fighting for his pride and legacy. Foreman may have taken him lightly, or just didn't plan for a long term strategy. 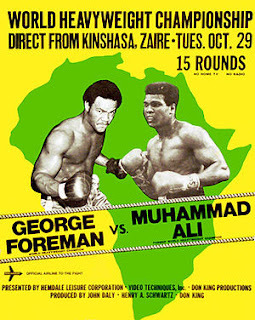 The older and more experienced Ali was not favored to win at all, but he used the strength and love of the people in Zaire (where the fight took place) to push him to higher heights. He was ready. For this fight, Ali would utilize the Rope-A-Dope, and let Foreman just throw punch after punch until he began to tire. 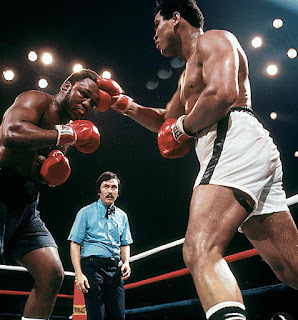 This strategy was great to use on a power puncher like Foreman, as he would soon tire out and not earn any points for throwing punches that did not land. When Foreman was missing or wasting his punches, Ali would strike, causing the fight to shift more and more to Ali. Mentally, by the 7th round, Ali had defeated Foreman mentally, as every time Foreman hit a solid punch, Ali taunted him even more with his words. Eventually, Foreman would get caught with a huge punch that made him wobble to the ground in the 8th round, and though he answered the ten count, the referee would stop the fight awarding Ali as the winner. This is one of the greatest fights ever to me for the simple fact that we've not seen a more masterful defensive and tactical perfomance from a boxer in the ring quite like this. Ali proved why he was the greatest in this fight and he never looked better. 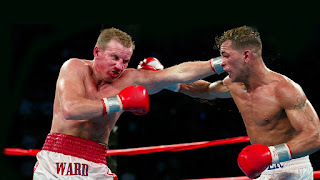 -The greatest fights in boxing usually go the distance or at least last 8 to 10 rounds. This is not one of those fights. This is the shortest fight on the list, but it gave you more action in the short period of time it lasted than most fights that went 12 rounds. With two heavy handed fighters standing on opposite sides of the ring, the fight dubbed as "The War" kicked off with a reckless abandon. Both men came out swinging, and every punch that connected, you could feel. 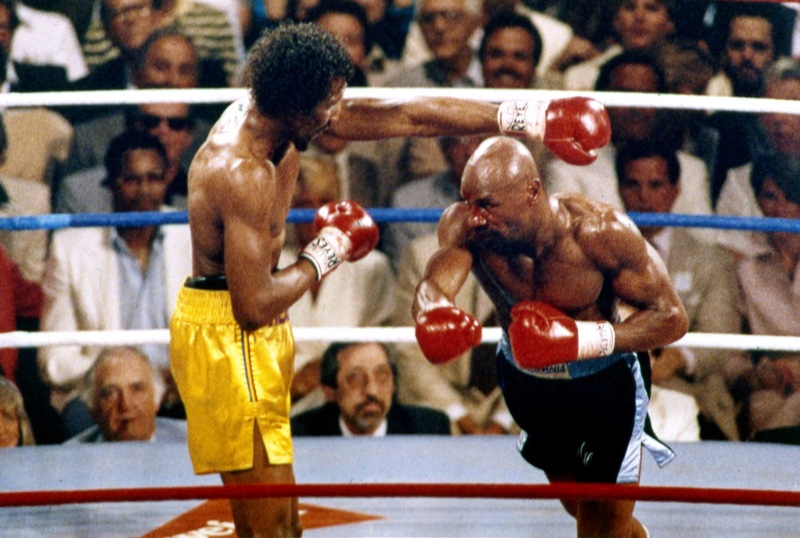 This was a brutal first round, as Hagler would suffer from a cut on his forehead, Hearns would break his hand, but both men just kept going. There was no need for defense or even pacing, both men went in for the kill and never stopped. The first round is honestly the greatest round I've ever watched in boxing. 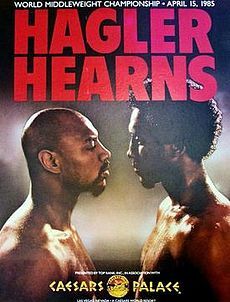 The 2nd round was less brutal, with Hagler controlling most of it, before Hearns came out swinging hard in the 3rd round. 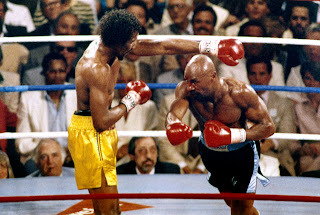 The 3rd round would prove to be pivotal as the cut on Hagler's forehead threatened to stop the fight. 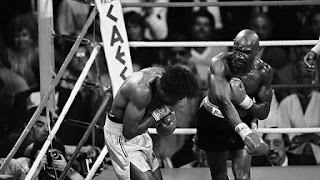 Hagler knew that he had to end it quick and he would respond with more fury and end up knocking Hearns down with vicious punches. 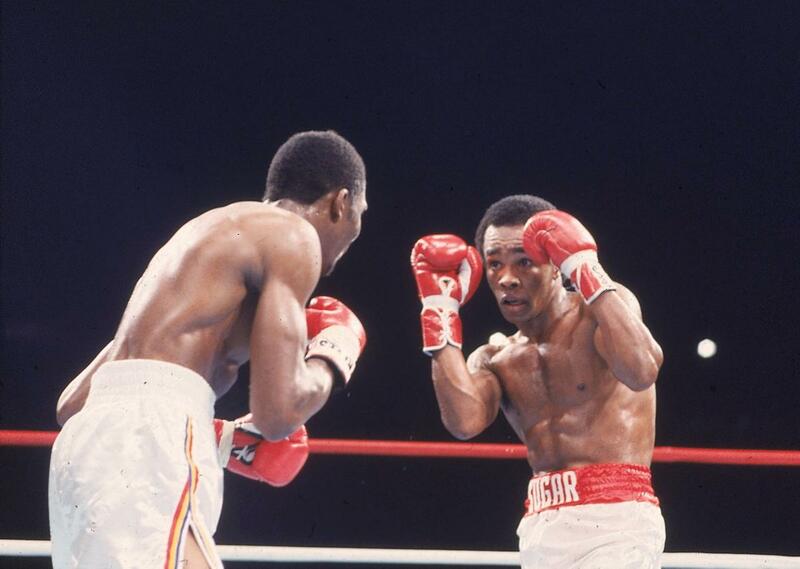 Unfortunately for Hearns, he would NOT BE able to continue and the ref stopped the fight. After 3 rounds, the fight was over. It didn't feel like 3 rounds, it felt more like 9 or 10. The first round felt like 5 rounds in one, which is why this fight is on the list. It's honestly the craziest fight I've witnessed with such a short run time but still one of the most enjoyable bouts I've witnessed. Hagler solidified himself as one of the greatest with this victory.